October’s ingredients for the Improv Cooking Challenge are carrots and curry. At first this really threw me because I am not at all familiar with curry. I’ve tried yellow curries and cooking with curry powder and as much as I’d like to like it, the food just doesn’t agree with my taste buds. Seeing as I host this event, it seemed even more awkward to skip it, so I sat down at the computer and decided that I wasn’t allowed to get up until I had found a carrot and curry recipe I could share with you that I even liked. Turns out that wasn’t nearly as hard as I thought it was going to be. 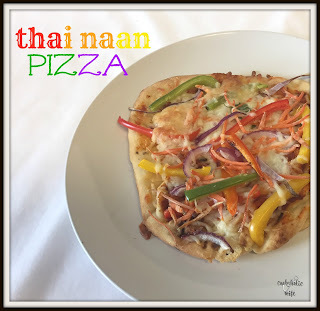 I was instantly intrigued by the idea of using red curry paste on naan bread to make a pizza. I know curry can be red, yellow or green and I figured it was worth a try to try another color to see if I liked it better. Pizza gets a Thai twist when the dough is substituted with naan bread, the traditional tomato sauce with a red curry paste and topped with fresh veggies and cheese. 2.In a small bowl stir together the red curry paste, tomato paste and water until thinned. 3. Spread the mixture over the naan, leaving a crust. 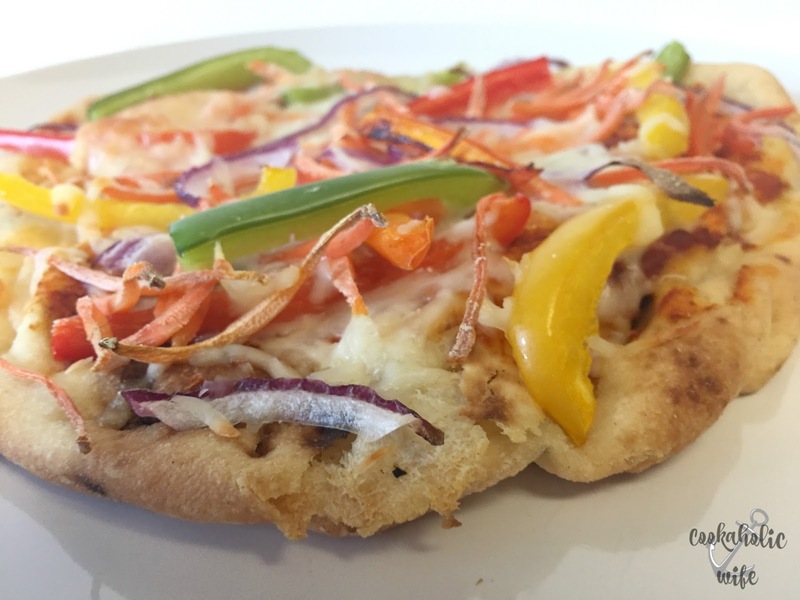 Sprinkle the shredded mozzarella cheese on top. 4. 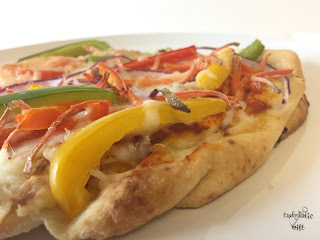 Top with the bell peppers, onion and carrots. 5. Bake for 15-20 minutes or until cheese has melted and vegetables have softened. 6. Cut into piece and top with fresh cilantro. The answer was a resounding yes! I honestly don’t think I’m ever going to use pizza sauce on pizza again when I can use this combination of red curry paste and tomato paste. It adds so much more flavor and depth! As you can see from the pictures, I completely forgot to add the cilantro. I remembered half way through the pizza, but by then it was too late to photograph it again. I think I’ve found my new favorite pizza. Seriously! It was that delicious. 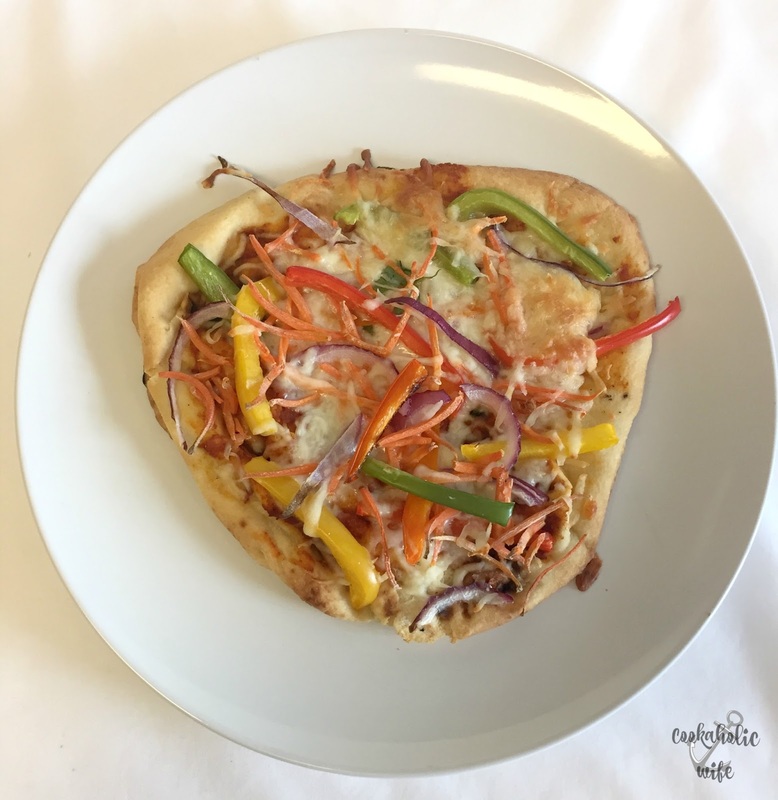 I love veggies on pizza to begin with, but they were still slightly crunchy and the spice from the sauce…OMG you to try this! Greatrecipe Nichole. Thanks for sharing and thanks for hosting. BTW, thanks for hosting and letting me be part of the group. I think I'm going to have way too much fun here. I've never tried red curry paste, but this sounds so good. I may 'steal' your recipe and make it for a Tapas Night, once I get a fully functioning oven again. Somehow it sounds like it would be a perfect munchie.